Orcas are good-looking creatures. Their distinct black-and-white features lend themselves well to stuffed animal versions, and might make you think these animals are the pandas of the sea. But there's a reason they're also called killer whales. Hint: this is not a photo of interspecies friendship. Scientists from the National Marine Fisheries Service (part of NOAA, the National Oceanic and Atmospheric Administration) studied killer whales off the coast of Antarctica. 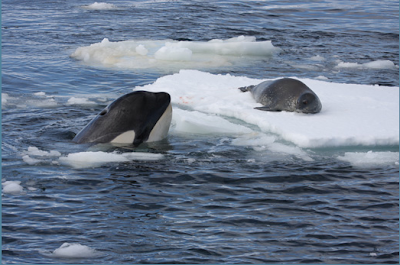 They report that a certain group, which they've dubbed pack ice (PI) killer whales, are specialized hunters. They use a clever cooperative hunting technique to kill seals, such as the hapless fellow above who's doing an impression of a burrito on a plate. The group hunting technique is called "wave washing," and it works like this: After identifying their target sitting on a piece of pack ice, a group of killer whales swims a little ways away from it. Then they turn and swim in formation toward the ice floe, beating their tails to make a wave. The wave reaches the ice and splashes over the seal, washing it into the ocean, where it rapidly becomes lunch. Just like humans and other smart, social mammals, killer whales can develop new behaviors within their communities. The PI killer whales have figured out a resourceful hunting technique that they share within their group. And they're persistent about it: if the seal doesn't come off the ice floe with the first wave, the whales will keep swimming back and forth, for half an hour or more, until it does. There's another curious consistency within the PI killer whales. They seem to have a taste for one particular species of seal, the Weddell seal. The authors report that these seals were not the most common item on the buffet; in fact, they represented just 15% of the hundreds of seals observed on ice floes in the area. But Weddell seals represented 14 out of 15 kills. The reason for the whales' taste preference is a mystery.